“Business as usual” for Greek luxury yacht charters is the message from the Greek Yachting Association (GYA) to clients planning on visiting the country. “At the moment, all yacht charters in Greece are proceeding without any problems at all,” said president of the GYA and CEO of Atlanta Golden Yachts Michael Skoulikidis. Michel Chryssicopoulos from Cape 4 Yachting argues that far from putting people off chartering, the situation could encourage people to come to the region. “Superyachts will still receive an excellent full service in Greece. Fuel, provisioning etcetera are still taking place as normal. The current uncertainty could possibly create good deals for yacht charters,” he told Boat International. 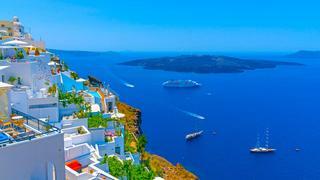 Skoulikidis agrees that people should still be planning to book luxury yacht charters in Greece and the Greek islands. “Most of the charter companies in Greece have proactively made the necessary arrangements well before the latest developments,” Skoulikidis said. “We hoped for the best but prepared for the worst in order to safeguard both our clients' and our own interests. "Greece was, is and will always be a yachting paradise. No matter how the story unfolds, yacht charters in Greece will remain a dream vacation and the Greek yachting industry possesses the means to weather the storm." Superyacht lawyer John Leonida from Clyde & Co told Boat International that visitors should take some precautions to ensure that their charter runs smoothly. One of the potential issues is that tourists are being advised to take more cash rather than relying on being able to use credit and debit cards. John Leonida also reiterated the importance of having a lawyer examine any charter contract.